If you've occasionally poked your head into the comments section of this blog or followed me on Twitter for any length of time, you've likely heard me say I never sell consoles or games once they're in my grubby little hands. 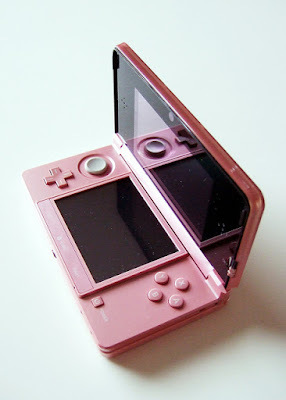 One exception involved me auctioning off one of my 3DS systems via eBay. I had five at the time (embarrassing, I know), and I rarely used this particular one, so I figured, "why not sell it to someone who would actually enjoy it?" Before I continue, I need to say that this 3DS basically was in brand-new condition. I'd only played it a few times and, as such, there were no marks or scratches of any kind on its screen or body. The system's outer box and its contents were similarly pristine. Anyway, someone recently bought it. Thrilling! I quickly packed it up--protecting it as much as I was able with bubble wrap and the like--and sent it on its way. Nine days later, I got an email from eBay. The gist of its message: the buyer wanted to return the 3DS and be given a full refund because it wasn't working. I was stunned. After all, I tested the system immediately before I shipped it and knew nothing at all was wrong with it. Still, I thought I'd be OK. While setting up the eBay auction for this system, I checked the box that informed interested buyers I wouldn't accept returns. Also, like I said earlier, I knew it was in perfect working order when it left my hands. I did wonder if maybe something had happened to the package as it made its way from me to the buyer, but that didn't worry me because I'd paid for insurance (out of my own pocket, I should add) that would come to my rescue in such a case. After exchanging a few messages with the buyer and doing a bit of research, though, I was back to despairing. First, I found out the package was not damaged during shipment, which meant that insurance I paid for was now all but useless. Second, I discovered that eBay pretty much always backs buyers in this sort of situation--meaning I may well be forced to accept the return and cough up a full refund. My main fears: that the buyer had somehow damaged the system and that I was going to have to take it back--leaving me with a broken 3DS that obviously would be of little interest to anyone on eBay or elsewhere. Thankfully, after hearing more from the buyer, I think it's possible I'll be able to fix the problem he or she is experiencing without too much hassle. Even if that's how the situation plays out, though, there's no way I'm re-listing the system. Also, I'm now of the mind that I'll almost assuredly never sell a game system through eBay again. Although it seems like this particular buyer isn't trying to pull a fast one on me, what's to stop someone else from doing so down the road? The fact is, there's nothing stopping someone from doing so in the future. Worse, there's little I could do before or after I list an item to protect myself as its seller from such a scam artist. So, I'm basically done selling game hardware on eBay. And I may be done selling games (expensive ones, especially) on eBay, too. Which is too bad, as I've never had a bad experience as an eBay seller before now. Should you follow in my footsteps? That's up to you. I would warn you to do whatever you can to protect yourself from situations like the one I just went through (I'm still going through it, actually, as it's yet to be fully resolved) before you auction off any of your games or consoles, though, especially if they're worth a bit of money.